In terms of practical skills that involve the physical use of your body, being able to successfully sync your hands and your eyes is really important. Sure, there are many physical movements we execute on a daily basis that are also integral to being a functional person, but it’s fair to say that exercising your hand-eye coordination isn’t a bad way to spend your time. Now, if you’re playing a sport like foosball or table soccer, then you’re really going to need to hone in on your hand-eye coordination skills. Your recreation timing, ability to move on a dime, and follow the ball with your eyes like a hawk all factor into becoming a better player. If you have a burning desire to step up your foosball game, we have good news for you: you’re in the right place! At Warrior Table Soccer, we’re proud to make the best professional foosball tables that you’ll ever come across (and play on!). We truly believe that our signature foosball table is perfect for novice foosball players, up-and-coming players, and professionals participating in national competitions. After all, our foosball tables routinely make their way to the professional circuit, and the pros agree that our foosball table is more than worthy of competitive play. So do ordinary, everyday foosball players! Keep reading below for some remarkably simple yet insightful tips to help improve the relationship between your eyes and your hands. One more thing — visit here to see how you can win a FREE Warrior foosball table! Throwing a baseball back and forth between you and a buddy, or even just throwing a tennis ball at a brick wall, is a great way to improve your central vision. Catching it with two hands is certainly beneficial (unless you have a baseball mitt on, of course), but challenging yourself to catch a tennis ball with one hand and alternate between the two of them is where you central vision-based hand-eye coordination skills are really going to benefit. Another way you can really improve your hand-eye coordination is by taking several balls and marking them with a certain color, letter, or symbol. Pick them up at random and toss them over to someone. When they come back to you, try to pick out which ball is which before you actually catch it. This won’t necessarily help your hands move more quickly, but it will train your eye to pick up on certain details more quickly. Juggling isn’t just for clowns or jokesters, though you may look a bit like one when you’re trying to learn how to juggle. Don’t worry about dropping things or looking silly! Juggling is one of the ultimate exercises in hand-eye coordination. As you’re juggling, your eyes naturally shift to the upper point of where the balls cross in midair. Your brain then makes snap decisions based on where your hands need to move. If juggling on its own isn’t challenging enough, or if you already know how to do it, we recommend adding in a few distractions. Have a friend ask to you spell out certain words, turn the TV on and blare the volume, or juggle on a balance board (carefully!). Jumping rope is a great two-fold way to condition yourself: it challenges your hand-eye coordination while distinctly improving your cardiovascular fitness over time. There’s a bit of impact associated with jumping up and down, of course, but it’s definitely not as harmful to your body as running (though running carries a myriad of health benefits too). 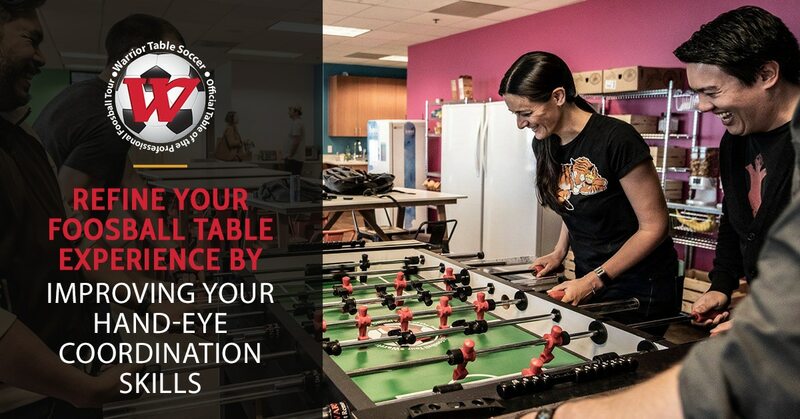 Though you’re using your arms more than your legs while playing on a Warrior foosball table, it’s still important to connect your hand and foot coordination as it relates to your eyes. Jumping rope is a useful way to do all of these things, all while teaching you how to maintain a steady rhythm in the process. There’s nothing wrong with playing a little basketball to help sharpen your hand-eye coordination (hey, basketball is fun after all, right? ), but dribbling a tennis ball in front of you challenges your hand-eye coordination more than it would with a standard-sized basketball. Spend a good ten or fifteen minutes practicing dribbling one hand and switching back and forth with that hand and your other hand. Dribble at different speeds and distances away from your body. There’s no “correct” way to practice here, but like practicing nearly anything, the more you do it, the sharper your hand-eye coordination will be! Are we telling you that playing some Xbox or Playstation is going to help you become a better foosball player? Well, yes and no. Too much of anything is obviously excessive, and that certainly applies to video games. However, playing games that are action and sports-oriented may sharpen your visual perception and motor skills to a considerable degree. Have Fun And Improve Your Game On Our Foosball Tables! The above tips to improve your hand-eye coordination aren’t universal, so by all means, play around these activities to find what works best for you. To really up your game or put your skills to the test, learn more about our upcoming foosball tournaments, stay tuned to our blog about foosball tables, or contact the team here at Warrior Table Soccer.